'England's Best Steak Pie' specifies Seagreens! A British steak pie containing Seagreens won a national Gold Award in June 2013. 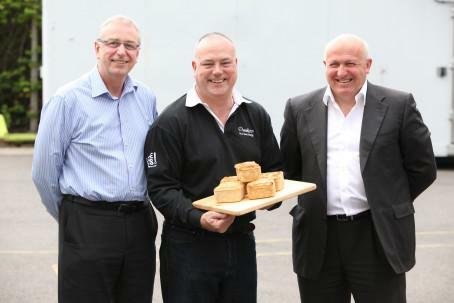 Dunkleys of Northamptonshire chose Seagreens® as an ingredient in their Pulled Beef Suet Pie to replace salt and add flavour, helping to take the 'England's Best Steak Pie' award from 100 competitors including some of Britain's leading bakeries. Dunkleys plan to use Seagreens in a range of other pies which will have outstanding taste and health benefits. "My family have been making pies for three generations" says Simon Dunkley, "using my Grandfather's pastry recipe". They also make delicious desserts! Seagreens' Human Food SeaweedTM (patents pending) is a natural prebiotic, has a significant antioxidant profile, and naturally contains all the minerals and micronutrients including iodine which contributes to normal thyroid, nervous system and cognitive function, the normal growth of children, normal energy-yielding metabolism, and the maintenance of normal skin. Added to which it enables good food like Dunkleys Pies to replace sodium chloride (salt) which is ubiquitous in manufactured foods. It all helps reduce the risk of cardiovascular disease. Its richness in minerals and protein amino acids help bring out the falavour of the food. In its own right, the wild seaweed is a complete natural food - produced to the world's highest standards by Seagreens in the Scottish Outer Hebrides. In recent years Seagreens has won numerous national awards itself for food and health research, its sustainable harvesting and production, and for its innovative products. The national competition was organised by Eblex, a division of the Agriculture and Horticulture Development Board focussing on the profitability and sustainability of English beef and lamb production.